Gensler designed the offices for Wilson Sporting Goods located in Chicago, Illinois. For 103 years, Wilson has called Chicago “home”. Their move to the iconic One Prudential Plaza, celebrates the company’s transformation of their brand and company to meet the needs of tomorrow’s athletes and consumers. 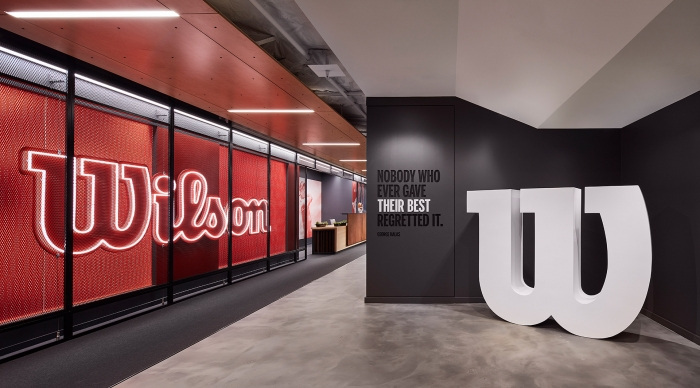 The design for the 100+ year-old, Chicago-rooted, Wilson brand starts at the front door, integrating brand and architecture in one gesture that places the visitor immediately at the heart of the brand. Color, light and texture all work together to evoke a strong sense of energy, pride and achievement, building on the successes of their previous space. For athletes at all levels, Wilson is the difference between going far and going farther. Their equipment becomes a priceless extension of an athlete’s drive and ability, which provides a key design motif throughout the space. Much of the base material palette in the space finds its inspiration in Wilson product — wood and leather featuring strongly. The client conference rooms express the human aspect of the equipment, capturing an athlete in motion with their product in vignettes that depict the major sports that Wilson lives and breathes. A linear move stretching from east to west is accentuated by a warm wood element reminiscent of the court and is framed by expanded metal, a nod to the fences of neighborhood parks and recreation spaces across the world. Subtle shifts in flooring material indicate the type of activity intended within that space – Move, Play, Experiment, Work. Workplace settings are broken into collaborative neighborhoods delineated by sport focus. Ad-hoc collaboration is wrapped by retail slat wall to house product and evenly lit by over-scaled pendant lighting like you may find in a gymnasium. The energy of sport and the ability to highlight the passion that goes into innovating for athletes of all levels of experience makes this space special. This is Wilson rising.